Yellowstone National Park is only a short hop, skip and jump from Bozeman, Montana and C&T RV Rentals. Rain or shine-there is no better way to discover this national treasure than in the comfort of an RV. With C&T's easy and convenient RV rentals you can be on the road and living in comfort while exploring Yellowstone's famous wonders. Old Faithful, Mammoth Hot Springs, the Grand Prismatic Pool, and the endless wildlife encounters will become some of your most treasured memories. Yellowstone National Park features 12 campsites that all offer RV camping. Set up a home base in Yellowstone and head out for more adventure. With the convenient storage space available with a rental RV, you can pack for any activity-hiking, biking, fishing, or just relaxation in America's first national park. Check out C&T RV Rentals Rates and Floor Plans to determine what package works for your ultimate Yellowstone adventure. Besides the national park campgrounds, there are many RV specific and inclusive campgrounds around the greater Yellowstone area. Make your journey to Yellowstone National Park just as memorable by camping on the banks of the Yellowstone River in Paradise Valley, or spend a night or two on the trout laden Gallatin River on the way to West Yellowstone and the park. The options for RV camping are endless in Montana! 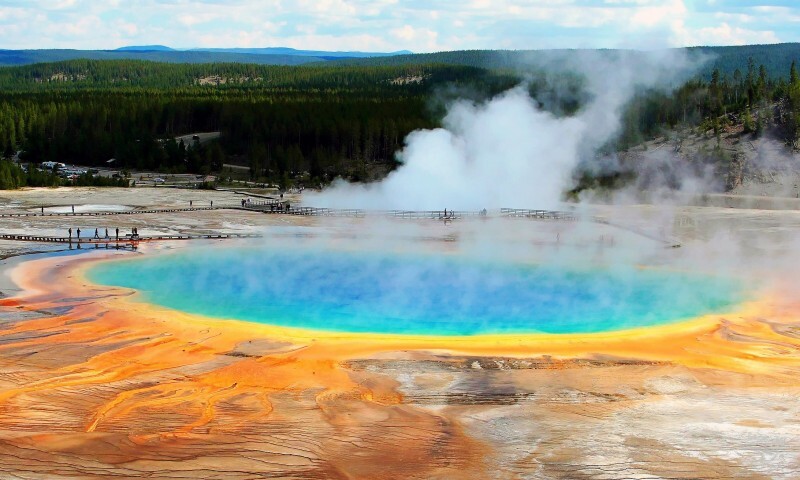 Yellowstone National Park may just be the beginning of an incredible adventure! Travel on the John D. Rockefeller Jr. Memorial Highway from Yellowstone to the unparallelled beauty of Grand Teton National Park. With RV campgrounds and plenty of views and moose to go around, Grand Teton National Park is a spectacular addition to any Yellowstone RV vacation. Still more adventure awaits in the northern reaches of Montana in Glacier National Park. Travel into the clouds on the Going to the Sun road and park the rental RV in one of Glacier's campgrounds for more adventures. The Hanging Gardens of Glacier will have never looked so beautiful, or felt so good when you can rest from your day's exploration in an RV. The journey through Yellowstone country and Montana begins and ends with C&T RV Rentals. A rental RV offers visitors and residents alike the ability to discover some of America's greatest treasures from the comfort of a home on wheels. It's time to make some unforgettable memories- Reserve your RV adventure today!